"They're Kissingurami. If one of them dies, the other dies too." The title Shiri refers to a species of fish that inhabit the rivers between North and South Korea. Throughout the film, the fish act as a rather goofy, heavy-handed motif, symbolizing the divide between the nations as well as the desire for reunification. It's appropriate, though, because Shiri is pretty goofy and heavy-handed itself. The Korean blockbuster than toppled Titanic, Shiri tells the story of two secret agents, Lee (Kang-ho) and Ryu (Suk-kyu) on the trail of Hee (Yun-jin), a deadly female assassin, who is wanted in connection with the deaths of several top officials in the South Korean government. A bit of Hee's past is revealed in the effective opening sequences, where she trains with North Korean special forces to become an unthinking killing machine, and the sequence works, even if it is essentially duplicating similar moments in Luc Besson's La Femme Nikita. The situation becomes serious when Hee, along with members of a rouge branch of the North Korean army, steal an experimental liquid explosive called CTX that is, in its inactive form, indistinguishable from drinking water, and that needs only heat and light to trigger an explosion powerful enough to level a city block. Such a setup seems rather routine to my Hollywood-addled brain, and writer-director Kang Je-gyu certainly wears his Western influences on his sleeve, from Besson, to Michael Bay, to John McTiernan. But audiences in Korea had never seen such a film come out of their own studios, and it became a hit, a sign that Korea could create a movie that looked and sounded like a big-budget blockbuster. With that goal in mind, then, it's easy to see why the final product is as hollow as Armageddon, if just as entertaining. The action scenes reveal some creative inexperience in the area, with poor choreography and maddeningly epileptic camera movements, but they still manage to be stylish and suspenseful enough. The main plot is augmented by some pseudo-significant utterings about the terrorists true wishes to reunite Korea and of the inequalities between the North and the South, but they are as surface and inconsequential as the somewhat similar motives in The Rock. There's a love story, too, that tries to be poignant but is betrayed by the undeveloped, vague characters. A surprise twist, intended to be melodramatic and powerful, simply opens up a few more gaping plot holes. Shiri is an entertaining movie, and fairly slick, but it's also fairly empty. Plus, it has three different scenes of a ticking bomb, complete with LED display, counting down for no one but the camera to see. Congratulations, Korea, you truly have made a Hollywood film. Image Transfer Review: Shiri has perhaps the best transfer I have ever seen of a foreign action film. Most of the Hong Kong epics tend to look rather washed out once they finally hit DVD, with scratchy prints and dull colors. This one looks like a newly minted Hollywood blockbuster. Colors are very bright and saturated. Black level is good, as is detail in the darker scenes. The image is perhaps a tad soft, but it isn't a major problem�the lack of edge enhancement to push detail actually creates a more film-like image. There is a bit of visible grain throughout, but it is hardly a distraction (grain is, after all, inherent to film). I noticed no glaring artifacts, and rarely more than a hint of mosquito noise. Audio Transfer Review: Columbia TriStar offers 5.1 mixes in both English and the original Korean, and while both are of the same high quality, I strongly recommend avoiding the English dub, as it's one of the worst I've heard in both performance and translation, robbing the film of what little poignancy and emotion it has. That aside, Shiri has a fun sound mix, the kind that places emphasis on flashy effects rather than on subtle creation of atmosphere (after all, it is an action film). The frequent action scenes make good use of an expansive front soundstage and also feature somewhat obvious but still very effective imaging from the rear speakers. The gunshots are unbelievably loud, but they don't overpower other elements in the mix (breaking glass, yells). Dialogue is nicely anchored in the center channel and sounds clear enough to me (except... in Korean). The score expands across the mains in quieter scenes and, once it gets going, utilizes quite a bit of LFE. Extras Review: The extras package on Shiri surprised me until I did a little bit of research and discovered that the DVD release in Asia is a 2-disc set with multiple documentaries and a few deleted scenes. While Columbia TriStar didn't port over all of that material (probably due to cost and rights issues), what is here is quite informative and interesting. The Making of Shiri runs 54 minutes and is presented in Korean with English subtitles. It covers the genesis of the project to its record-breaking debut in Korea and across Asia. The beginning is heavy on the PR fluff as each actor is introduced, but then the focus shifts to highlighting all the different aspects of production, with surprisingly candid behind-the-scenes footage augmented with interviews from the cast and crew. Frankly, quite a bit of this material I found unintentionally humorous. The Korean media makes a big deal, at the beginning, out of the fact that the film cost a little over $5 million, "far less than Titanic." It's obvious why. This movie could never have been made as cheaply in Hollywood because everyone would get sued. From guerilla filming at a soccer game, to creating some of the gunfights using real bullets, to forcing the actors to do their own stunts, the production was one big injury waiting to happen (and, it seems, every actor manages to get hurt at least three or four times a day). One of the special effects guys comments that the action scenes should be safe for the actors because "they are some of the most important people in the movie." Hilarity aside, there is also information provided on the compositing and miniature effects and on the recording of the musical score (apparently, a full orchestral score is a rarity in a Korean film). Overall, it's a good piece that manages to give quite a bit of perspective on the film, and on filmmaking in Korea in general. Also included is a music video in English for the Carol Kidd song When I Dream, which is a running theme through the film, not to mention an obvious attempt to cash in on the Titanic success of Celine Dion's smooshy ballad My Heart Will Go On. The video does an excellent job of spoiling the entire movie, from the surprise twist, to who lives and dies. Hollywood studios take note�you'll probably want these editors to cut trailers for you. Closing out the disc is a red-band R rated trailer, along with spots for The Tailor of Panama and The Crimson Rivers. 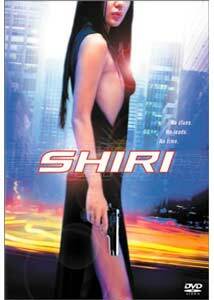 A landmark Korean release, Shiri proved that the country's fledgling film studios could produce a blockbuster on par with Bruckheimer and Bay. It's an impressive attempt, considering, but it's kind of sad that all the efforts and energy of an obviously talented group of filmmakers have been funneled into the creation of what is, essentially, one more Hollywood schlock-fest shoot-'em-up.